Proper bird feeder placement makes a startling difference for the attractiveness of a bird feeder, both for the birds eating from it and the birders watching it. By placing your feeders where they will be most convenient for you and the birds, you can make the most of every opportunity to provide good food for a wide range of birds and to see many species enjoying the meal. Natural Feeding: The best place to put a feeder will simulate a bird's natural feeding preferences. 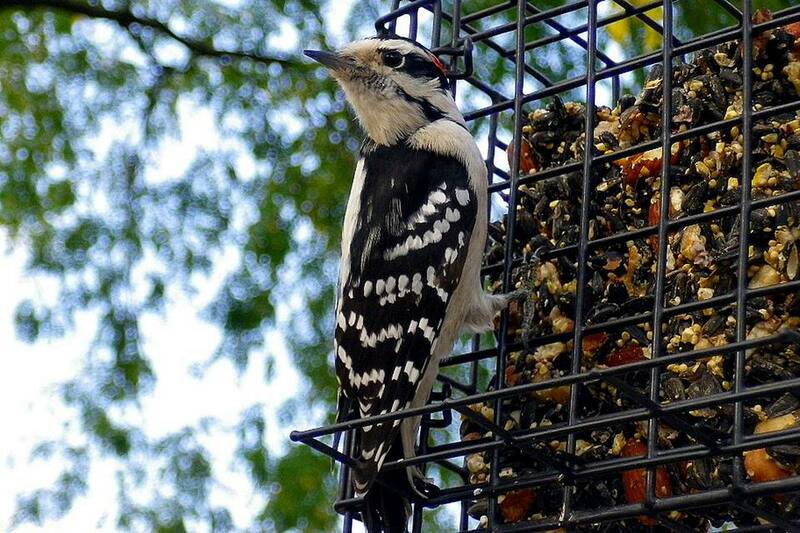 Suet feeders for woodpeckers, for example, will be more popular if placed near tree trunks or thick branches. Platform feeders for ground-feeding birds do best in areas where those birds will normally feed. Nectar feeders will be more popular if placed near nectar-producing flowers. Activity: Feeders in quiet, less disturbed areas generally do better than feeders placed near active areas such as a play structure, garage door, or patio. While birds can become accustomed to some noise and activity, many species prefer a quieter area for feeding. Avoid putting feeders near wind chimes or other artificial noisemakers, but note that there are certain sounds that can help attract birds. Placing feeders near those natural sounds can help bring birds to them. Safety: Birds will not visit a feeder in an unsafe area. Position bird feeders roughly 10-12 feet from suitable shelter such as trees, brush piles, or shrubs to give birds a safe, fast retreat whenever a predator is nearby. At the same time, take suitable steps to protect backyard birds from cats to make the feeding area even safer. Windows: Window collisions are often fatal to small birds. Feeders should be placed either very close to the window (less than three feet), or much further away (greater than 10 feet). From close feeders, birds cannot hit the window hard enough for injury, and distant feeders provide enough room to safely maneuver. Other ways to prevent bird window collisions can also be useful and will minimize this problem. Visibility: Birds need to see a feeder before they will readily visit it. Placing feeders in a sunny, open area makes them more visible to passing birds. This placement also gives feeding birds a good field of view to stay on the lookout for predators and other threats. Chemicals: If you use chemicals in one area of your yard, such as pesticides on a garden, bird feeders should be placed far away so seed or other foods cannot become contaminated. Once you attract many birds, however, you may need fewer chemicals altogether, since birds will eat insects and help keep your yard and garden naturally healthy. Squirrels: Squirrels can damage feeders in many ways and will eat the seed before birds have a chance for a meal. Placing feeders well away from trees, sturdy shrubs, fences, roofs, and other structures where squirrels can leap from will help keep the feeder free from damage. Taking other steps to squirrel-proof your feeders can help minimize this problem no matter where your feeders are located. Personal Space: Different bird species have different feeding territory sizes. A very crowded feeding area can create more aggression and territoriality as some birds drive others away from the feeders. Spreading feeders out over a greater distance can allow more birds the chance to feed and help lessen the risk of spreading diseases at bird feeders. View: Place a feeder where you have a clear, unobstructed view from an easy window. Also consider the light, as bright sunlight may make it easier to see birds’ colors and finer field marks for easy identification, but could make photography more challenging. A shaded area may have less glare and afford better views during summer months. Also note how visibility may change in different seasons as shrubs grow, trees shed leaves, or other changes occur in your landscape. Refilling: Placing a feeder in an area where it will be easy to refill can help you keep the feeder in good shape to attract more birds. If you need a stepladder or special tools to refill a feeder each time, you may be less likely to keep it filled, cleaned, or repaired properly. Shelter: If your climate is prone to strong wings, heavy rain, or abundant snowfall, it is best to position feeders in sheltered areas. This will help protect the feeder and the birds using it from the brunt of poor weather. It will also make it easier to care for and refill the feeder in adverse conditions, just when the birds need nutritious food the most. Mess: Feeders are naturally messy with discarded hulls, molted feathers, and feces. Regular cleaning is essential, but positioning your feeder in a space where the mess will not be as noticeable or objectionable can minimize any annoyance. For example, place the feeder in a natural, brushy area instead of near a heavily manicured flowerbed or over a decorated patio. This way, any mess will not be as visible. Use colors to attract birds to a feeding station by adding nearby flowers, flower pots, or decorative items to catch their attention. Take steps to get birds to use a new feeder by providing their favorite seeds and other popular foods for them to try. Provide nearby perches, bird baths, and suitable shelter for both safety and nesting to meet all of the birds’ basic needs so they will stay in the area for more than just feeding. Note seed levels regularly. Even if you aren't seeing the birds visit, they may be sneaking to your feeder when you aren't watching. As they get used to the feeder, their visits will be longer and more frequent, making it easier to see the birds in action. If no birds use your feeders, no matter how carefully they are placed, it can be helpful to move the feeder after 2-3 weeks and try again to attract birds. You may also need to inspect the feeder to be sure the food is fresh and accessible, and if everything is suitable, just be patient. In time, birds will find your feeders, giving you many opportunities to enjoy their mealtime company. Are You Hanging Bird Feeders Safely? Tips for Getting Birds to Use a New Feeder? You Do Not Need New Feeders to Feed More Birds! All About Feeding Birds in Winter - Foods, Feeders & More! How Low Can You Go? Try Ground Bird Feeders! Where Is the Best Place to Hang Hummingbird Feeders?